Upgrade to AC Performance: Today's households are connecting more devices than ever before - with more and more iPhones, Androids, tablets, and laptops laying around in any given home, it's important that each device gets the speed and coverage it deserves. By upgrading your laptop and desktop computers to AC, you can immediately enjoy the benefits of faster wireless speeds and better connectivity - all with less wireless interference so you can enjoy doing what you love most. Delivering Wi-Fi dual band speeds of up to 150/433Mbps, the DWA-171 is the perfect solution for those looking to enjoy HD video streaming, fast file transfers and lag-free video chatting. Backward Compatible: While the Wireless AC Dual Band USB Adapter delivers blazing fast AC speed to your laptop or desktop computer, it's also backward compatible with older Wi-Fi routers and devices - no updates or adapters necessary. Maximize your AC Performance: While your new AC adapter delivers the latest and the greatest in wireless performance to your laptop and desktop computers, you can further optimize your home network's performance by upgrading your current router to one of D-Link's AC routers. By adding an AC router to your home network (DIR-810L, DIR-820L), you can avoid speed bottle-necks and maximize your AC performance. 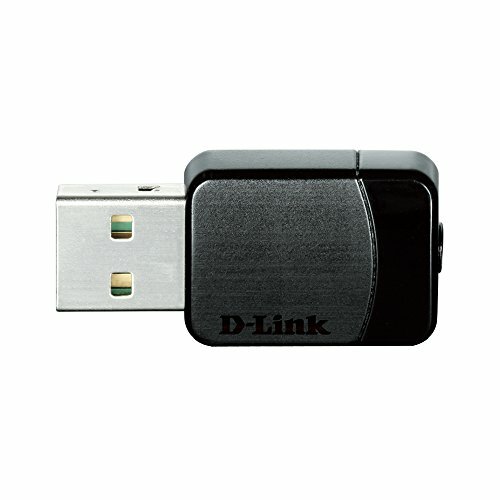 Dual Band Advantage: The Wireless AC Dual Band USB Adapter delivers dual band performance to your laptop or desktop computer for intelligent, versatile, interference-free bandwidth. Check your e-mail and surf the Internet on the 2.4GHz band; or game, make Skype calls and stream HD movies with less interference on the 5GHz band. Whatever you like to do online, dual band has you covered. Easy Push Button Setup: Establish quickly and easily a fast, secure home network that will have you browsing, streaming, and watching in minutes. Connection is only a push of a button away!